Blake Realty Group – Service You Deserve, People You Trust! 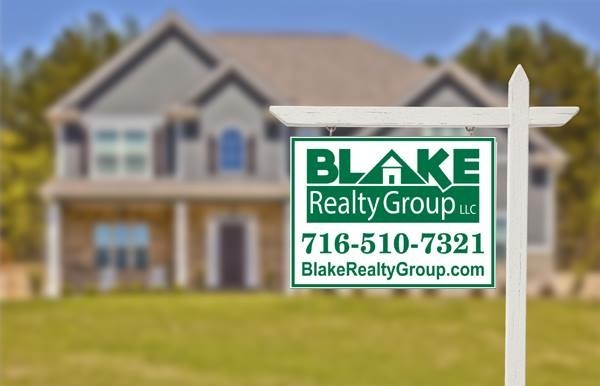 Blake Realty Group, LLC is an independent real estate brokerage firm specializing in Buffalo and Western New York home sales. Our mission is to offer our clients honest and accurate information, timely communication and the highest quality of customer service. Satisfied customers are our best source of referrals and we strive to provide the absolute best service in the industry. Blake Realty Group, LLC can be with you every step of the way from listing a home or searching for a home right through to closing. The home buying process can be daunting but we are here to help you understand everything and make the entire transaction as stress-free as possible! Paul handled both the purchase of our new home and the sale of our old home in spring of 2012. The sale of our old home resulted in a multiple bids within 4 days of listing the house. In addition, the transaction became more complex when we encountered issues with the sale of our home at closing. Paul’s persistence and willingness to pick up the phone and get information on our behalf was tremendously helpful in that situation. Paul can be trusted to provide honest feedback He is an extremely hard-worker who works tirelessly on behalf of his clients. I highly recommend Paul to anyone requiring a real state agent for either purchase or sale of their home in the Buffalo area. Selling a house can be a stressful time. Paul walked us through the whole process and closed the deal quickly. We even got a better price than we expected! I would definitely recommend Paul as an agent. We were extremely happy with the results! Paul handled the sale of my home in Hamburg in January 2011. An out-of-state job offer prompted me to need to sell my house suddenly and Paul was overly accommodating throughout this unexpected transaction. Paul’s market analysis of my neighborhood and thorough review of the home led me to list for $10,000 more than I had anticipated and the final sales price was over 98% of the list price. My home was under contract with a buyer quickly after being listed and we closed within three months beginning-to-end. Paul went above and beyond to help me out with this transaction, including giving me a thorough understanding of what was needed from me, establishing a solid list price and negotiating an unexpectedly high sales price, and he even kept a close eye on my vacant home after I moved. I have known him personally and professionally for over 10 years and would highly recommend him to anyone in the Western New York area looking to buy or sell a home. I have Used Paul Blake for both buying and selling a house. He is very knowledgeable about the local real estate market and is always happy to answer my questions. His honesty, knowledge, and attention to detail make him the perfect professional for you and your family. When I decided to purchase my first home, I was completely unaware of what was in store for me. Paul was recommended to me by a friend, and things became a lot easier. Paul’s professionalism and knowledge helped me to search for my future home without stress or worry, and made the entire process as easy and pain-free as possible. I was even able to purchase my house for several thousand less than it’s listed price based on Paul’s professional recommendation. I have owned my home for two years now and could not have been happier with how things have turned out. I would recommend Paul to anybody who was searching for a home in a heartbeat.